Yahoo appears to making a fresh push to challenge YouTube’s supremacy in online video as rumors about potential acquisitions and other deals heat up. The latest has Yahoo in talks to acquire video syndication service News Distribution Network for $300 million, according to a Wall Street Journal report Monday. NDN distributes video to more than 4,500 news sites on behalf of content partners, including Reuters, AP, CBS, Fox Sports and The Weather Channel. In January, it was ranked fourth in comScore’s ranking of top U.S. video sites, with an audience of 51.3 million, one place ahead of Yahoo, which had 44.9 million. Even by more than doubling its video audience, Yahoo would still fall well short of YouTube’s monthly audience of 157.6 million. Yahoo declined to comment on the report, and an NDN spokesperson was quoted as saying the company wasn’t in talks to be acquired by Yahoo. The WSJ story comes on the heels of rumors the Web giant is trying to lure popular YouTube video creators to switch over to Yahoo. According to Re/code, Yahoo wants to expand its video streaming service—Yahoo Screen—with clips from YouTube stars. 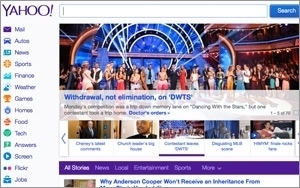 Revamped in September, Yahoo Screen currently features content from “Saturday Night Live,” “The Colbert Report,” “The Daily Show,” as well as MTV shows, such as “South Park” and MTV News. Material from YouTube stars would augment this programming and potentially bring in new audiences for the site and keep them sticking around longer. According to Re/code, Yahoo may even build its own content management system, or could buy one, with speculation that Vimeo a potential target. Yahoo CEO Marissa Mayer has made video a key area of focus for the company since taking over in July 2012. Last year, it made an unsuccessful bid to purchase video hub Dailymotion for a reported $300 million. The deal was blocked by the French government, which didn’t want one of the country’s top Internet companies to be owned by Yahoo. Yahoo’s numerous acquisitions under Mayer have mostly been much smaller deals for technology and talent in the mobile or social media space. During the company’s fourth-quarter conference call in January, Mayer named video as one of Yahoo’s four core areas along with search, communication and digital magazines. “In video, we are focused on building our audience and our library. Changes in user behavior have guided our approach to video content, focusing on introducing a personalized well organized video experience that engages our users,” stated Mayer. Increasing video advertising inventory is also a goal of those efforts. More lucrative video ads could help lift Yahoo’s sagging display ad business, which last quarter dropped 6% from the year-earlier period to $1.26 billion.